Cost Efficiency Options have great leveraging power. As such, an investor can obtain an option position that will minimize a stock position almost identically, but at a huge cost savings. Higher Potential Returns you don't need a calculator to figure out that if you spend much less money and make almost the same profit, you'll have a higher percentage return. When they pay off, that's what options typically offer to investors. Flexibility Options can be used in a wide variety of strategies, from conservative to high-risk, and can be tailored to more expectations than simply "the stock will go up" or "the stock will go down." Hedging Options allow investors to protect their positions against price fluctuations when it is not desirable to alter the underlying position. Volatility The use of options also allows the investor to trade the market's "third dimension" Options allow the investor to trade not only stock movements, but also the passage of time and movements in volatility. Most stocks don't have large moves most of the time. Only a few stocks actually move significantly, and then they do it rarely. Bullish strategies in options trading are employed when the options trader expects the underlying stock price to move upwards. It is necessary to assess how high the stock price can go and the timeframe in which the rally will occur in order to select the optimum trading strategy. In most cases, stocks seldom go up by leaps and bounds. Moderately bullish options trader usually set a target price for the Bull Run and utilizes bull spreads to reduce risk. While maximum profit is capped for these strategies, they usually cost less to employ. Mildly bullish trading strategies are options strategies that make money as long as the underlying stock price does not go down on options expiration date. These strategies usually provide a small downside protection as well. Writing out-of-the-money covered calls is one example of such a strategy. 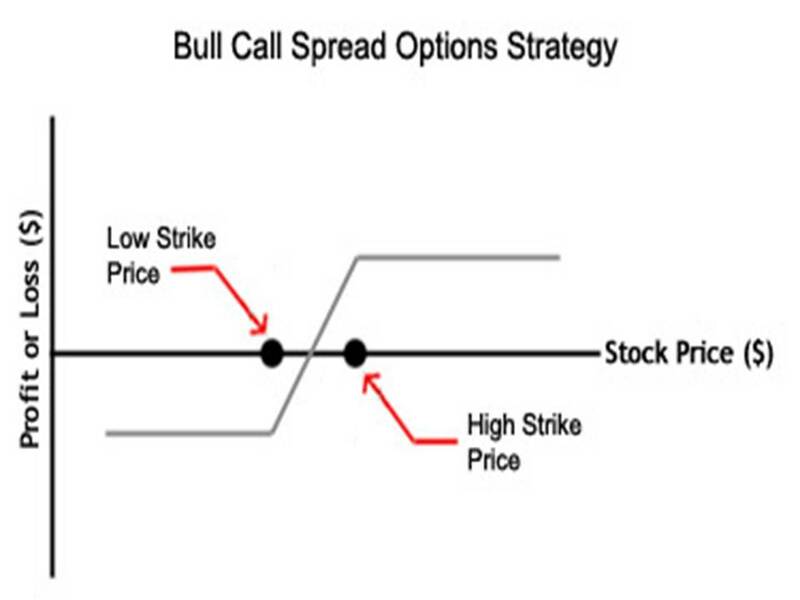 In a bull call spread strategy; an investor will simultaneously buy call options at a specific strike price and sell the same number of calls at a higher strike price. Both call options will have the same expiration month and underlying asset. This type of strategy is often used when an investor is bullish and expects a moderate rise in the price of the underlying asset. Bull call spreads can be implemented by buying an at-the-money call option while simultaneously writing a higher striking out-of-the-money call option of the same underlying security and the same expiration month. 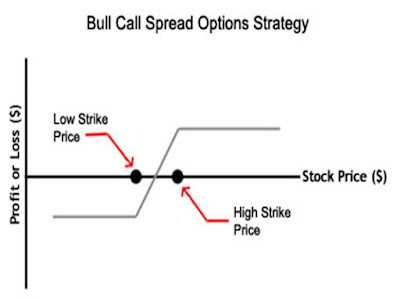 When implementing a bull call spread, an option trader purchases a call option at one strike and sells the same number of calls on the same stock at a higher strike with the same expiration date. By implementing a bull call spread, traders can hedge their bets limiting the potential loss. This is the advantage when comparing to purchasing a call outright. Remember that there are no sure-fire ways to make money by using options. However, knowing and understanding the strategy is a good way to limit losses. The long call option strategy is the most basic option trading strategy whereby the options trader buys call options with the belief that the price of the underlying security will rise significantly beyond the strike price before the option expiration date. The right, but not the obligation, to buy or sell specific amount of a given stock, index, at a specified price during a specified period of time. The price of the option depends on the price of the underlying, plus a risk premium. Medium of exchange for options contracts allowing the holder the right to sell or buy an underlying commodity on an open market. The option contracts define the trading limitations of the market, including the option type and the expiration date. Options are derivatives, which mean their value is derived from the value of an underlying investment. Most frequently the underlying investment on which an option is based is the equity shares in a publicly listed company. Options are traded on securities marketplaces among institutional investors, individual investors, and professional traders and trades can be for one contract or for many. Fractional contracts are not traded.